Implementing a new recycling program, or trying to reinvigorate an existing one, can be challenging, and even more so when the new program is kicking off at a multi-family dwelling. Multi-family dwellings, also known as apartment buildings or condominiums, present their own unique challenges when it comes to recycling. Despite the challenges, however, finding what works at each location is well worth the effort. According to the 2010 US Census, more than 22 percent of the population lives in in multi-family housing. That’s roughly a quarter of the entire solid waste stream! Like many buildings and homes along Absecon Island, Super Storm Sandy was a game changer for Ventnor on the Bay (VOTB). The 40-year-old structure, which is located on the inter-coastal waterway in Ventnor, took a beating during the storm; its boiler room inundated with water and the first floor heavily damaged as well. As luck would have it, one week prior to the storm, VOTB had a new tenant move in by the name of Tom Carlson. A Philadelphia native, Tom’s move to VOTB was only supposed to be temporary until he decided where he really wanted to live. Four years later and counting, Tom is the building’s property manager and calls VOTB home. His background as a construction engineer was just what the storm-ravaged building needed. Much to his credit, Tom had most tenants back in within 30 days. Tom used the devastating storm to make many improvements to the building, including to the recycling program. Although some recycling was happening in the building, it was clear that more could be done. 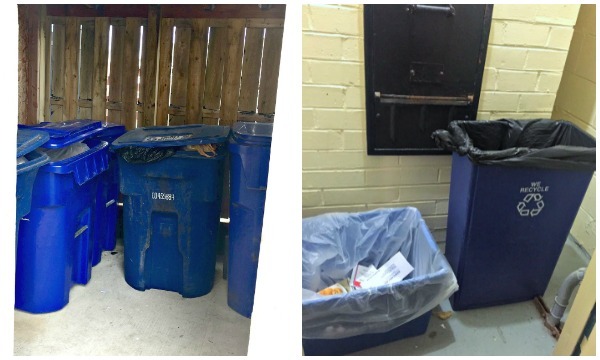 All of the residents in 114-unit building were notified that recycling containers would be located in each trash chute area, and the areas were clearly labeled with a poster of the items that can be recycled through ACUA’s recycling program. Tom made lots of improvement to the outdoor trash and recycling areas as well. On a recent visit to VOTB, it was clear recycling is a priority at this property. Trash and recycling areas are all clearly labeled and recycling containers can be found in the building’s common areas. Tom is constantly looking for ways to reduce the building’s carbon footprint, and as he sees it, recycling is one of the easiest first steps. Apparently the residents understand this as well. The building recycles more than 20,000 pounds of material each year – an impressive amount! Ventnor on the Bay is an example of multi-family dwelling recycling done right that can serve as a model for others to follow. Want to learn more? Please contact us for assistance with recycling at your multi-family dwelling.